This section is for the use of fully participating members of the forum. Ads are accepted only for classical, Renaissance, baroque or flamenco guitars, theorbos, ukuleles or lutes. Ads for any other type of instrument (electric, electro-acoustic, etc.) or equipment will be removed. Members may only sell their own instruments or instruments they have built themselves. Business sales from dealers or ads on behalf of other people are not allowed. New members may advertise one instrument only at any one time, with a maximum value of $500. Members of the 020 group may advertise one instrument only at any one time, with a maximum value of $15000. Members who have made at least 60 posts, who have been registered for at least 6 months and who make frequent helpful contributions to forum discussions, may advertise up to 3 instruments at a time, without price limitation. If you are selling more than one instrument, a separate post for each instrument is required. The maximum number of ads that may be posted is 3 per year (i.e. in any 12-month period). Failure to respect these conditions will result in the removal of the ads and in flagrant cases the account of the member may be removed without warning. Do not give your phone number or your email address except via private message. In particular please indicate a starting price as well as a location or locations where it is possible to try out the instrument. The above template covers the most essential details, but sellers should of course provide further information in their ad on any special features. ($..200 = $200), dots are inserted to bring all prices to 5 characters, allowing the use of an ascending sort by subject via the sort menu at the bottom of the page to display ads in order of country and price. Capital letters are restricted to the initial letters of proper names. Ads are moved to the archives as soon as the guitar is sold, or when they have had no response for more than one year. A message can be edited by its author for the first 21 days after posting, after which it is necessary to ask a moderator to make any changes. Please do not denigrate a guitar for sale or the luthier who made it. Moderators will remove such messages. Whether or not the sale should proceed is entirely up to the parties involved. Members who buy an instrument unseen do so at their own risk and should exercise due caution. For added security, it is advisable to use a licensed online escrow service (see http://en.wikipedia.org/wiki/Escrow). The Convention on International Trade in Endangered Species (CITES) means that some materials used in guitars, although formerly allowed, may now require permits or be illegal to sell across national borders, or even locally in some places. It is the responsibility of the buyer and seller to ensure that the sale complies with all applicable laws in their respective countries. - Sound: Traditional deep Spanish sound with rich, strong singing trebles ( Segovia - like ) and deep basses. I'm selling my Ramirez 1A due to financial reasons. 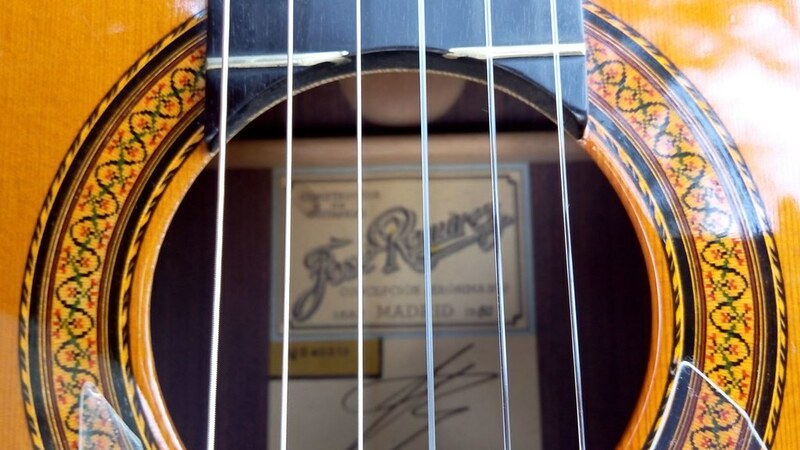 It was originally purchased in Spain at the 80s, chosen among other 1A's from a Professional Guitarist. The guitar is in an unbelievably good, like-new condition for its age! It only has a couple of small play marks that can barely been seen, a half mm small ding next to the bottom ( seen a little at the bottom of 1st pic below ), and a small hairline crack in the back - very hard to capture in a photo - repaired with the same wood many years ago. An excellent Greek luthier has made new nut and saddle so the action is relatively low, with room to go even lower. ( basses 3,75mm, trebles 2,75 @ 12th fret ). For that to be achieved the bridge is shaved a little but has also been varnished, so it is again like new. Of course the original nut/saddle are also available. I can take more pictures and/or sound sample for anyone seriously interested upon request. ps. the guitar is also advertised locally..
New crazy price --> 2900 euros for a fast sale ! Can an admin change the subject? Beautiful guitar, George. Good luck with the sale! Can an Admin change the subject to €.2900 please? Is this guitar for sale to those of us in the United States? I figured I would ask because of CITES. Thanks George. It looks lovely. I thought CITES was only for BRAZILIAN Rosewood which is endangered. Is Indian also an issue? It was made decades BEFORE CITES...how could that be recently harvested against the rules? I would be interested without the CITES hassle. Yes it is starting from Jan 2017. Even if the label says that it's pre-conventional the paperwork is still needed for exporting/importing. From January 2, 2017, all species of the Dalbergia family, such as the Indian Rosewood (Dalbergia latifolia) needs CITES papers. Just a thought... maybe the Ramirez shop could provide the necessary "pre-CITES" certification. "Some places remain unknown because no one has ventured forth. Others remain so because no one has ever come back." CITES is only needed if the guitar is made January 2 2017 or later, not before. Thank you very much rinneby for the clarification ! 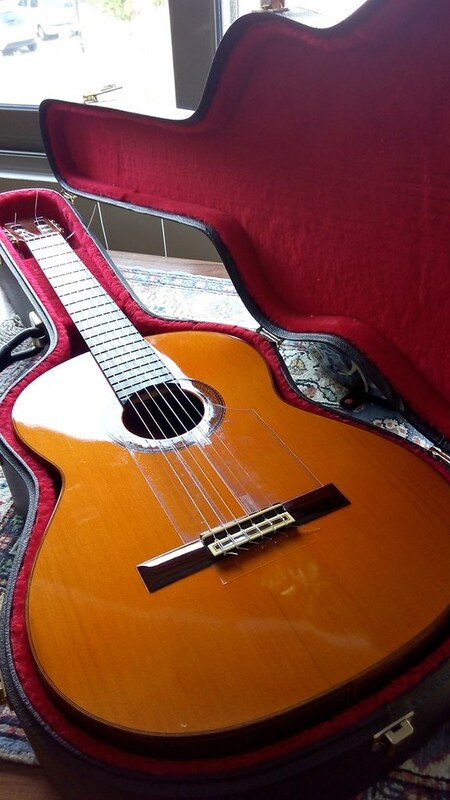 This guitar is not only collective and at excellent condition for its age, but has great sound and playability too ! I appreciate that Jon spent a lot of time trying to understand CITES. However my understanding is, if you ship rosewood outside the EU you need an export permit, for which you require to be able to show that the rosewood entered the EU legally (e.g. before 2 Jan 2017). So my understanding is, that the permits are typically easy to get for old instruments, but still required in contrast to what Jon thinks. In the end you have to enquire with your own authorities. I know a major German based internet retailer who does not ship to Switzerland any longer, because they would need to apply for CITES permits. "From January 2, 2017, all species of the Dalbergia family, such as the Indian Rosewood (Dalbergia latifolia) needs CITES papers." - This is not the case. You don't need any kind of permit to sell a B-listed instrument inside EU (like this Ramirez), if you can prove its made before 2 Jan 2017. With that said, it's always good to have a permit.